Science was never a strong subject for me. I struggled with it a lot; but I was always curious about it. Chemistry was an elusive topic, but I could follow some of biology lessons easier. (Though I was never a fan of the lessons that required dissection. *shudder*) I could relate to main character Aggie’s drive to know, learn, and understand, and that made her more endearing to me. 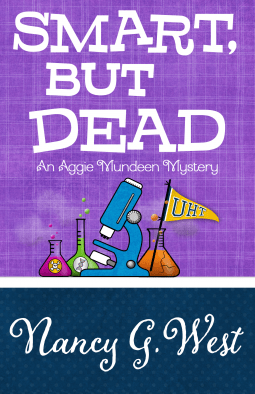 In Smart, But Dead, the third book in Nancy G. West’s humorous mystery series, Aggie is heading back to college to learn about the science of aging. She’s feeling the pressure of nearly 40 as a single woman, and she’s quite eager to know if there’s a way to stop or even reverse the aging process. The trouble is that the course teacher is a man with whom she has history – and not a good one. Right off the bat, Aggie tries to make amends with the professor. It seems to work, but he’s still acting strangely. When he literally drops dead, Aggie is drawn to figure out just what happened. But her efforts at investigation only serve to make her look guilty of doing the professor harm. Smart, But Dead is easy to read and fast-paced, full of wit and humor. It’s the first of the series that I have read and I found Aggie to be a fresh character in a cozy mystery character canvas. To win an e-copy (Kindle or Nook) of Smart, But Dead, please send an email to jenna.czaplewski@gmail.com. Be sure to put “Smart, But Dead Giveaway” in the email subject line. Winner will be chosen at random. Enter before 10pm on December 5. Winner will be notified by email. Jenna, Thank you for hosting me on your blog site and for the great review! And thanks for mentioning the first two books in the series (short-listed for Chanticleer Awards.) I LOVE writing about Aggie, and it delights me when a reader enjoys her as much as I do!